No way!!! why oh why,KJ? you old set-up was f*cking awesome (maybe the best on this site)!. why switch to the ikea cookie-cutter set-up? I understand upgrading the CdJ's,but that pioneer crap over the rane mixer? or those TT's even connected,anymore? what you do with the old table ( I would have giving my left n*t's, for it 10 yrs ago) the Urei? the boutique isolators? the space-teks? I'm sorry,man. I'm sure mine is not the reaction,you wanted to hear....I'm happy,you are least still playing. In Kevin's defense he does state that he still has all his old gear. thanks, for pointing that out.I'm sure he knows the value of all that gear. I also can see now, what he has accomplished. he went from an analog set-up ,to that of the more modern digital set-up. I totally understand it, at present I'm in the same process, with my set-up. my first reaction here, was from shock., and for that I'm sorry. Trust me, I had the same reaction as you at first and had to re-read his post just for clarity. Seems to me it would be easier to be more creative on his old system than his new system. Plus the old system looks like an audiophile DJ. The new system looks like any other DJ's system who has a lot of money. You guys are hilarious LOL. There is a lot more to this so I will explain. 1. 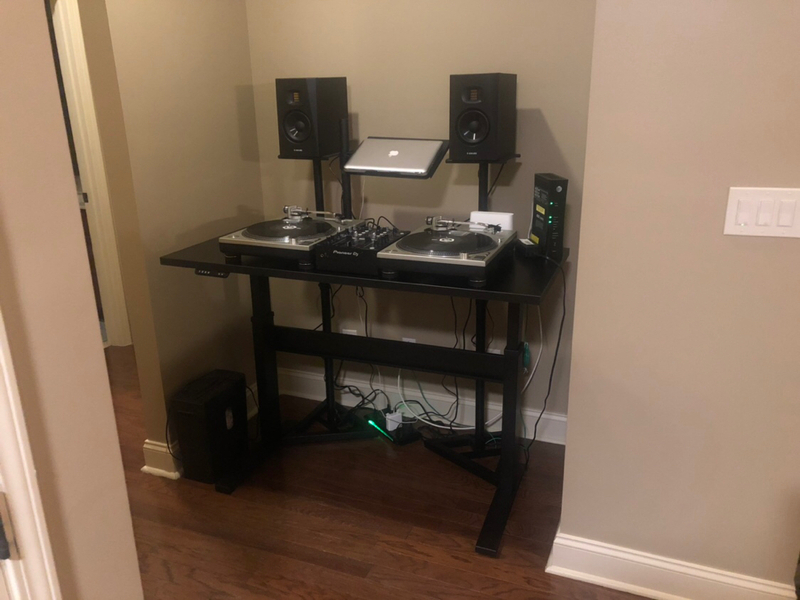 I moved a couple years ago and the new dj/music room is in an upstairs bedroom because that is the only place for it. Moving that behemoth original console up a narrow stairway would have been a nightmare. This setup is more modular and way easier to move if/when needed. 2. The new CDJ 2000 NXS2's are waaay heavier than the old CDJ 1000's, and the Spacetek stands were unable to support the weight of the new players. Also, nobody makes a plate that will lock the new players in, in the same way the CDJ 1000 plates locked the old players in. They only have the universal plate which is just not secure enough for me when dealing with players that cost $2,200 each. I tried everything I could to figure out a solution that I was happy with but in the end it just wasn't going to work. 3. I love the Rane and Urei rotary mixers and the isolators. But I also wanted to be able to play on some of the more modern mixers like the Pioneer, because that is what every venue seems to have and I want to be comfortable and fluid on it. The Pioneer is table top as is every other popular mixer today, and there was no way to make that work on the old console which is formatted for 19" rack mixers which are getting to be very uncommon at this point. I am having some additional pieces made that will allow me to switch the mixer out for the Rane or Urie, giving me the best of both worlds. 4. Again, I still have that entire old setup. Everything including the console itself with the Spacetek stands which is sitting in my garage right now as I type this. happy, you kept your sense of humor, about me losing my cool..sorry man!. it's hard to watch so many of us older analog/rotary guys, switch over, just to stay in the game..the other day,the venue, I work at,allowed me to play around with their pioneer nxs system, and i'll be honest, I was totally lost with the crossfaders. so you having one to practice wit, makes logical sense. I'm stuck with having to go to my venue on my off days, to practice,and to get a better grasp, if I ever intend on really playing there_I also dealt with that same Spacetek problem,you had. my solution would have been to make a custom size wooden top (using the same wood,as my tabletop) for the nxs2000, but I gave up,on that idea,entirely. my Spacetek's were pretty beat up,but if yours aren't, I'm positive, you can get a good price on them on Ebay. not sure, on the dimension of the pioneer NXS mixer, but I can share with you,an idea that may possibly work,for you. rails come in difference width, or can be custom ordered. https://mega.nz/#!sxJFQILQ!AQrmcA3Jx...o8kQIx5B7ZPVXY...anyway,great to hear from you, and wish you all the best with your new system. No worries at all man. I tried a few different ideas for a shelf for the CDJ's but really wasn't 100% happy with any of them. Additionally, I still would have had to deal with moving that massive console up a narrow flight of stairs, and I still would have had issues using the more modern table top mixers in that console. It became apparent that it was time to come up with a totally new idea that would allow me to do all of the things that I want, and this new console will do just that once I have the other accessory pieces made. 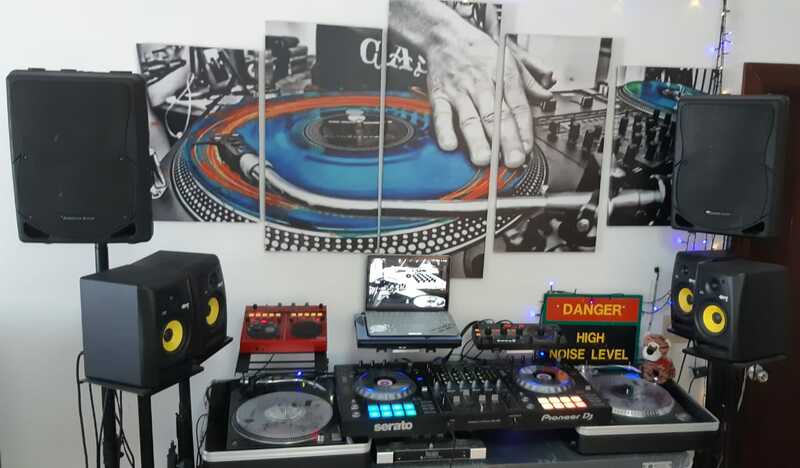 On another note, I also considered getting a Rane MP2015 as in your pic, thinking that it would give me my Rane rotary fix, and it would fit right in place where the 900 is without need for adding additional pieces to the new furniture. Unfortunately after researching it I realized that Rane totally dropped the ball on one specific thing on that mixer that is a total deal killer for me. I need to be able to EASILY switch each channel between Phono, Line, and Digital in's. While there is a selector switch on the face it doesn't work that way. You have a tiny little switch on the BACK of the mixer to switch between Phono, Line and Digital, and whatever that switch is set to will flow into the switch in the face and let you select between that and USB A or USB B. Totally stupid IMO and killed that mixer for me. If they hadn't done that the MP2015 would have been a no brainer. But whatever it's fine, with the new pieces I will still be able to swap in my MP/XP 2016a and the Urei with my isolaters so I will still be able to get my rotary fix when I want. Attached is a photo of my DJ setup. My wife is pleased that our kitchen table is free of my equipment. Let me know what you all think. I'm going to finish this off with speaker isolation pads for my studio speakers. Last edited by DJBSLYDE; 02-12-2019 at 07:56 AM. ^ +1- there a minimalistic appeal to your set-up. Thanks Dennis. I appreciate your kind comment. I also appreciate light-o-matic, Nicadraus, and a few others that have given me guidance to create a good home setup. $310 sounds like a deal, how much are the mixers and what brand are they?